Four Palestinian’s have been killed and dozens wounded after an Israeli tank shell hit the third floor of Al-Aqsa hospital in central Gaza, according to a Health Ministry spokesman. "There is still shelling against the hospital," he said speaking to AP. He said he found bits of a rocket, presumably from one of the projectiles. The Israeli military had no immediate comment. In the past it has accused Hamas Islamist militants of firing rockets from the grounds of Gaza hospitals and of seeking refuge in the buildings. 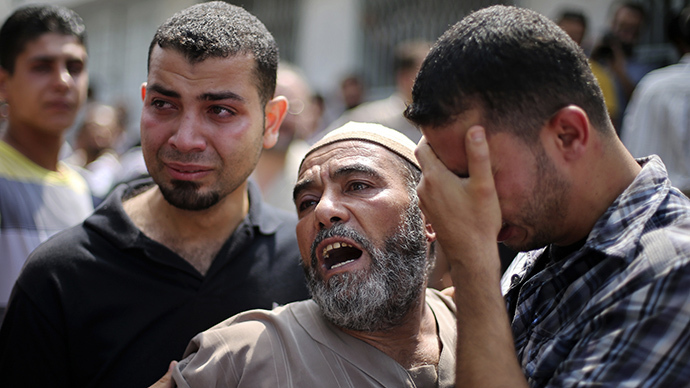 The Palestinian death toll has now risen above 500, since the Israeli army started its offensive in Gaza on July 8. Gaza health officials put the exact figure at 518, which includes over 100 children. In addition, MSF cited its field coordinator in Gaza, Nicolas Palarus, saying, “United Nations shelters are now overcrowded and hygiene conditions are extremely worrying,” Haaretz reports. The IDF death toll from the hostilities in Gaza has risen to 25, with seven Israeli soldiers killed in the last 24 hours, Haaretz reports. There has also been a major rocket barrage over southern and central Israel, with two rockets intercepted over Tel Aviv. There were also reports of two terrorist cells infiltrating southern Israel via a tunnel from the Gaza strip on Monday and residents were ordered to remain inside and roads were closed. The death toll in Gaza has now reached 508 with 3,130 wounded, since the operation began 14 days ago.